I spent the last week in Albuquerque at Rio Grande, my favourite jewellery supplier, taking classes forming metal using miniature stakes. The classes used the super-awesome Fretz hammers and stakes and were taught by Bill Fretz himself! That probably doesn't mean anything to you but he's one of the "rock stars" of the business, and the hammers and stakes he's designed are the best. The opportunity to spend a week learning from him how to use the hammers and stakes he designed to form metal was just too good to pass up. Albuquerque is located in a high-altitude desert and it was very hot and windy. The plants were quite different from what we have in Southern Ontario - I had no idea that yuccas grew so tall! - but they were beautiful in their own way. I spent my last morning there at the local botanical garden in the Southwest US section but those are pictures for another post. Today I want to show off what I made during the week. 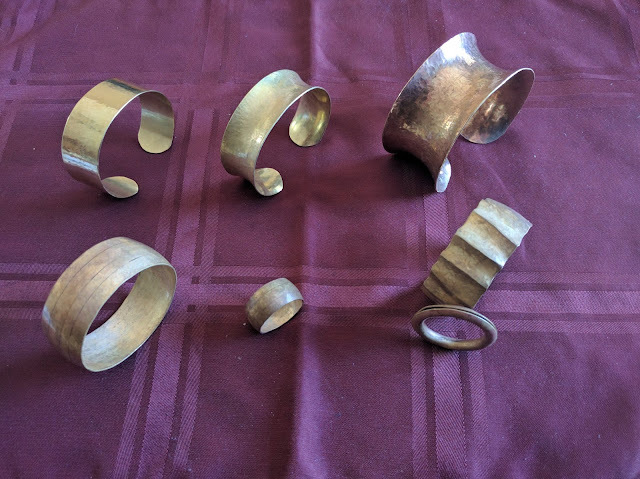 We practiced on circular tubes of varying widths and diameters; most often, we sawed the finished forms open to make cuffs. We used brass for almost everything. 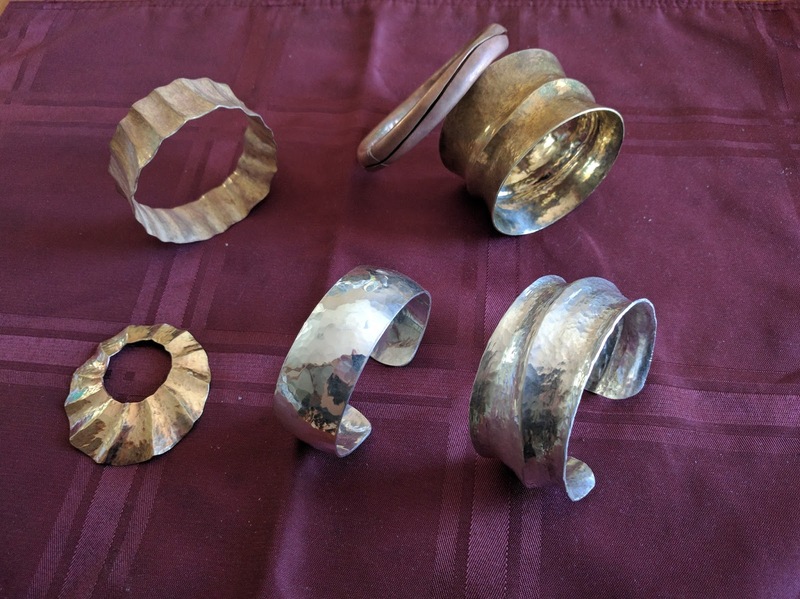 Almost all of my pieces still need polishing - but these were metal forming classes, not metal polishing classes, and I wanted to make the best possible use of my time. I can polish things at the studio if I want to. In the first class, Forming metal with miniature stakes, we learned how to control the hammers - not only to hit what you're aiming for, but how to hit with the right amount of force - then how to make concave forms, how to make convex forms, and how to add fluting (ridges). For reference, the background plaid has a repeat of about 5 1/8" in each direction. Whew! We did a lot in those two days! In the second class, Continuing metal forming, we focused mainly on fluting: adding it in different directions, to different shapes, and we used fine silver for a couple of pieces. We didn't do as many pieces over these three days because the fluting takes quite a bit more time to do than it does to make a convex (synclastic) or concave (anticlastic) cuff. I loved these classes, although I found the week exhausting. Hammering and learning are both very tiring! I really, really, really love the process of forming these pieces and I will be purchasing the equipment to continue learning. I may end up practicing in copper instead of brass, just as I've been doing with the foldforming. I don't know exactly where these techniques will take me but I am bursting with ideas and I'm excited to get to work on realizing them. (updated to include starting blank measurements and background repeat, as well as formatting). Posted by Chantelle at 10:01 a.m.
excellent work! can't wait to see what else you make.